A HANDFUL OF WRITERS are capable of flushing the nonsense out of fly fishing literature. And by nonsense, I don’t mean silliness, but the wonkish tilt that plagues fly fishing writing. Serendipity and self-deprecation are better devices in the hands of a good, knowledgeable author, but they are harder to handle. Fly Fishin’ Fool is Babb’s third book in six years. It is, thankfully, more of the same — that is, not at all the acceptably reserved effluent of someone who gets paid to observe and comment on fly fishing. It is almost always unexpected. That’s hard to achieve in a sport as old as fly fishing, and probably the only other writers alive who do it as well are Thomas McGuane and John Gierach. With the the exception of the rare columnist like Ed Zern, thirty or forty years ago it would have been unseemly to write about fly fishing and the outdoors and not pretend to a higher “station” in the sport. This wasn’t so true before the middle of the last century, so one has to wonder why we started taking ourselves, as anglers, so seriously, reciting bug Latin and preparing the stage for a new generation of instant experts. More than the humorists, the poseurs have provided the nonsense of the past quarter century. If you haven’t guessed it, I enjoyed Fly Fishin’ Fool almost as much for its desire to laugh at aloofness as I did for the writing. James Babb is an ex-East Tennessean, backwoods handyman and old boy scribe who just happens to nail virtually every idea he introduces and analogy he invents smack on the head. This is very clever and adventurous writing without a hint of apology but all the politeness of a southern sit down dinner (that’s a 2 o’clock lunch, by the way). Finish the 242-page dinner with a recipe for great-grandma’s fried chicken that, despite being titled “A Gratuitous Culinary Afterword” is less gratuitous than most other endnotes and bibliographies you’ve never actually read, and you have a fine and filling meal indeed. Fly Fishin’ Fool talks about fishing in Costa Rica, in Maine, in Wales, in Tennessee, in Montana and Idaho, and about the various carefully attuned characters the author has fished and shared misadventure with in those places and others. He ties size 24 caddis emergers on 7X tippet and then floats rubber-legged beasts in Yoohoo-colored water. It’s the kind of variety we want in a fishing book these days, I think, when for better or worse we travel with, or at least have our horizons defined by, anglers who’ve “done it all.” James Babb surely has done it all, or at least enough that most of us could feel we’ve missed out. But a consistent quality of his writing is that we feel a part of it, leaning over that rock ledge next to “one of North America’s busiest nonurban highways” and wondering how the hell to get a fly to those giant browns beneath us. Babb knows how to be Arnold Gingrich and Robert Ruark all at once. He quotes George Eliot, Jane Austen and 19 th century backwoods yard-spinner George Washington Harris all in the same breath. And after it all, after taking you down some wildly crooked paths and ripping some high-tech waders on the fine points of life’s purpose, he teaches you something about fly fishing. 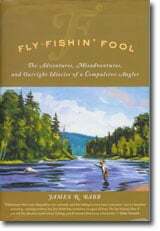 Chances are, if you buy Fly Fishin’ Fool, you will want Babb’s first two books, Crosscurrents and River Music. You won’t go wrong with any of them and if you haven’t read the author’s regular columns in Gray’s, you’ll may find yourself going there too. Either way, if you’re not already a reader, an introduction to James Babb is long overdue.